We yachtless feel inadequate, we just do. 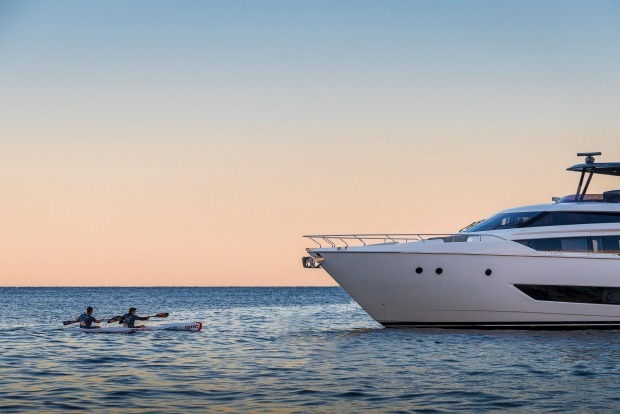 Try as we might not to, we squirm each time we hear some plutocrat has just bought a specced-up, 73-metre Feadship and is mooring it in Sydney, Portsea, Monaco or wherever. I’m even worse than most try-hards: filled with boat envy and weighed down by a chip on my shoulder to the extent I seriously flirted with succumbing to the boat-owning disease in 2012 when Tom Perkins, the legendary Silicon Valley investor, had his last boat for sale at the Sydney marina I part-owned. This essay won’t cure you of the lust you feel every time a boat with lovely lines glides by. However, wearing my investment banker hat, I can reassure your rational mind that big boats are indeed financial suicide, while also suggesting that the guys who buy those boats are actually worse off than us. 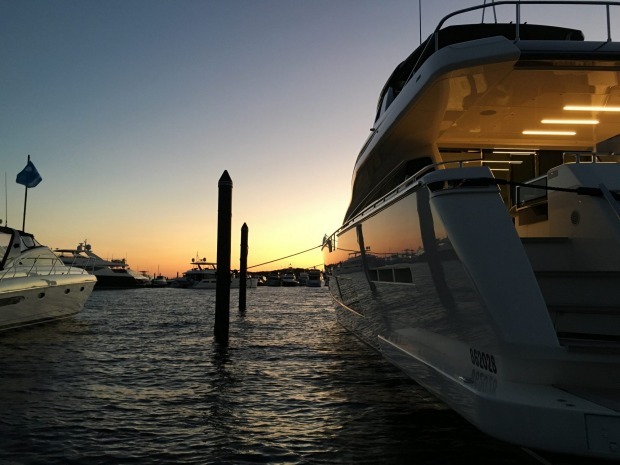 The sleek lines of a superyacht moored in Rose Bay catch the sunrise over Sydney Harbour. Not only do they own a bottomless money pit, they still feel inadequate because, let’s face it, someone’s always got a bigger one. First, let’s ponder the reasons people desire a megaboat. In brief: as a means of transport; a place to sleep; a venue to entertain; a floating activity centre; and, most important of all, to show off. Working our way through that list, most expensive boats simply sit on their mooring – although, true, there are some special places you can reach only by water. As entertainment venues they work OK, with better views and worse kitchens than anything on land; as activity centres for jet skis, kite surfing, diving and everything aquatic, they are supreme. 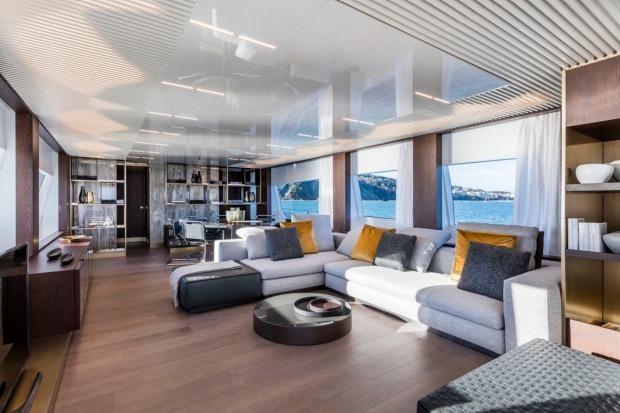 This isn’t a waterfront apartment – it’s the interior of a Ferretti 850 cruiser. At this point, I realise I’m hardly making a watertight “against” case but bear with me, because here comes the crunch. Let’s look at them as investments. Boats are basically piles of fibreglass, wood and metal floating in a corrosive wave bath of saltwater. There’s just nothing good that can be said for them as a way to preserve or increase capital, beyond the fact that they’re a better bet than racehorses. The boat brokers who will happily take your $50 million or so for a modest second-hand superyacht will tell you up front that this and all your other toys – the seaplane, the sports cars, the horses, the farm – should never total more than 10 per cent of a conservative view of your net worth. Not many listen to that advice. 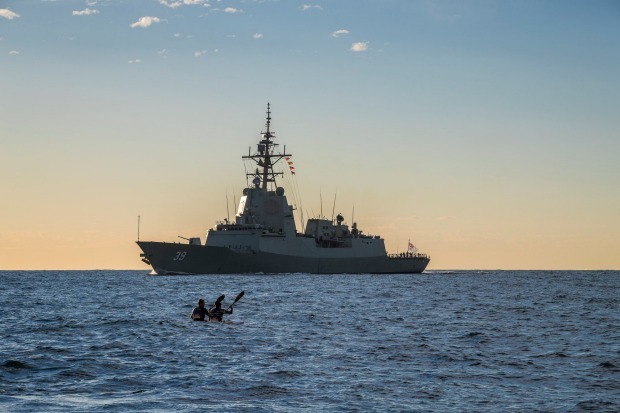 “Someone always has a bigger one”: the Royal Australian Navy’s new destroyer HMAS Hobart proves the point as it dwarfs Mark Carnegie and Luke Horder in an ocean ski. I have, and hence feel a thrill every time I disembark from a boat I just rented. It’s intensely satisfying knowing the boat dramas, crew issues, repositioning logistics and sinking values are someone else’s nightmare. Losing 10 per cent a year on a boat is a good result; closer to 20 per cent of the value being flushed is what you should expect. Having said all that, let me now tell you my guilty secret. Truth be told, I do have a boat and it’s cost me plenty. Not in terms of money so much, but definitely in time and misery. My boat is an Epic double ocean ski, which retails for $3000-$4000. 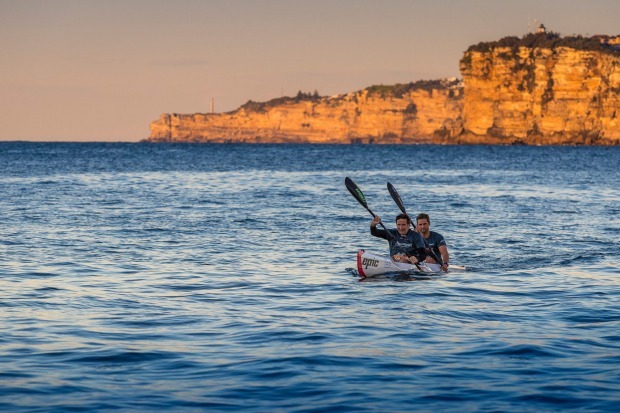 Mark Carnegie and Luke Horder cut through the still morning waters near Sydney Harbour’s North Head in their Epic double ocean ski. Now I’ve no doubt far more locals wonder what the hell I’m doing taking off on my ocean ski from Sydney’s Rose Bay than wonder why anyone would be silly enough to buy a money-sucking superyacht. Look out towards North Head any Saturday about 8am, and you might spot two small drenched heads bobbing up over the tops of the waves as my kayaking partner Luke Horder and I thrash madly out to sea. I usually borrow a mate’s boat to use as a support vessel, so we only have to paddle with the wind behind us, and there’s a hot shower waiting the moment I’m out of the water. I bought the double ocean ski in 2011, and it’s opened up a whole new world to me. 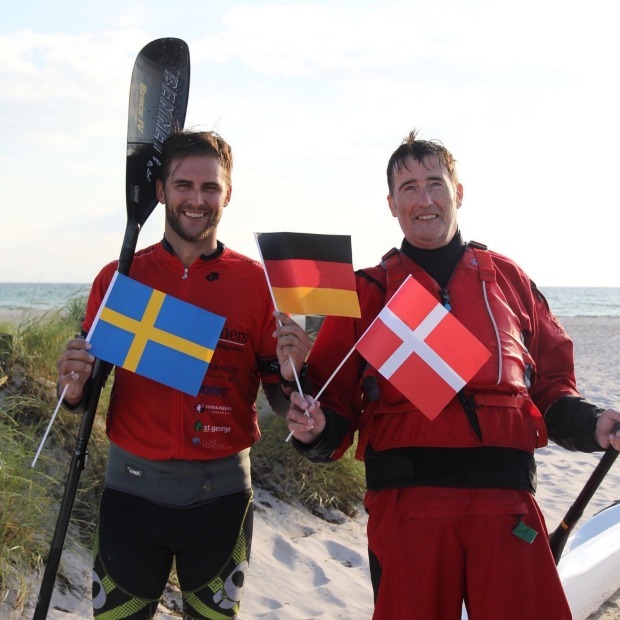 In 2016, Carnegie (at right) and Horder paddled from Germany to Denmark, and then on to Sweden. Using hired ocean skis similar to the one I own, Luke and I have amassed a number of “lads on tour” T-shirts and caps. Together, we’ve paddled the Kaiwi Channel in Hawaii, the Irish Sea from Ireland to Scotland and caught a tidal wave that took us 10 kilometres along a river in Sumatra. Then there was the time we paddled from Germany to Denmark, cycled 170 kilometres or so, and then paddled to Sweden alongside the Øresund Bridge. The misery I’ve felt (you wouldn’t believe the pain in your arse and lower back after a few hours of paddling) has been equal to, and yet very different from, the misery of my superyacht friends when the engine blows on their 23-metre Sunseeker, or their best mate buys a boat three metres longer. Nevertheless, I feel in some small way I, too, understand the agony associated with the ownership and upkeep of something that floats. For a start, learning to paddle a kayak was one of the most humiliating experiences of my life, and believe me I’ve had a few of those. You’re told you’re going to fall in a thousand times but until it actually happens, it’s impossible to understand how many times that is, and the embarrassment when friends and family are watching. To rub more salt in the wound, the person who taught me and still acts as my engine – the aforementioned Luke Horder – decided after my wretched experience at his hands that no one else should have to endure it. He has since totally revised his training plan with special beginner kayaks that actually make it fun to learn. Luke’s Sydney Harbour Surf Club is flourishing as a result. But his penance is he’s stuck at the front of our double kayak pulling my sorry arse across the Cook Strait in New Zealand this November. And he’s forced to do training sessions with me every weekend before then. I’ve invested nearly a thousand hours of effort and misery in my little craft – the equivalent of roughly six months of full-time work. So am I mad? Is this really the antidote to owning a superyacht? Just buy a Riva and be done with it, I hear you say. Carnegie and Horder muscle their way past Toro, a 26-metre Ferretti cruiser. In the end it comes down to this: my English girlfriend says the thinner me (from all the exercise) and the smaller ocean ski (all I could justify after my divorce cashectomy) are both far sexier than her previous bigger man/boat combination. I’m just not sure that’s entirely a compliment. But let’s put hull envy aside to finish on a high note with all the sublime places you can go by sea – be it a superyacht, dinghy, kayak or submarine. Where to sail next has been the question since Homer sung the Odyssey, and 2700 years later we’re not much better at agreeing on a common answer. 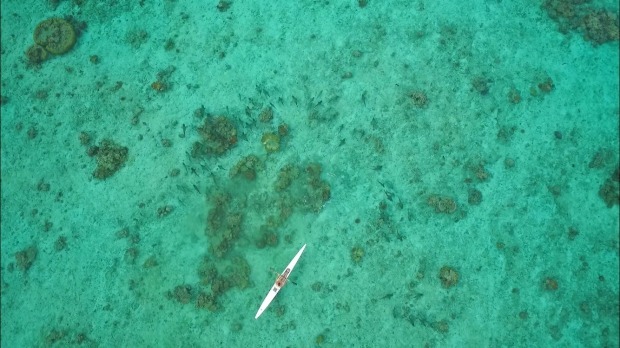 For me, the answers are diverse, ranging from using a boat to try (unsuccessfully) to snorkel with the orcas off the north coast of Norway, through to using a boat to swim with a whale shark, dugongs and mantas (far more successfully) at Ningaloo Reef on the far north-west coast of Western Australia. The years when we used to regularly rent a boat for a nine-day holiday off Queensland’s Fraser Island when my three girls were younger remain among the most golden of memories, immortalised in photos and memories etched deep in the family database. Funnily enough, one of the very best of our many family holidays on water was spent aboard the cheapest boat we ever hired – the one at Ningaloo. Being cramped together for four glorious days on a 12-metre boat took nothing away from the magic. We had dinner on the back deck each night with fishing lines slung deep, and eating was suspended every five minutes so the next fish could be hauled in. Waking at dawn before everyone else and heading up top to watch the sunrise is one of life’s greatest joys. The pale colours, the soft breeze, the perfect temperature, the “rosy-fingered dawn”, as Homer puts it. Nothing beats it as a “Welcome to this day”. Who needs a superyacht when an ocean ski will get you up close to marine wonderlands such as the Claremont Isles in far north Queensland.